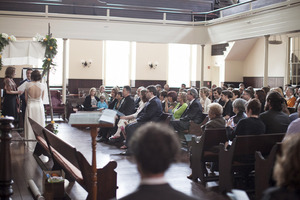 For your once in a lifetime wedding, consider the simple beauty of The Friends Center Meetinghouse. Ideal for couples looking for a unique venue or those seeking a traditional setting for a non-traditional ceremony, our rooms can be transformed into your very own wedding wonderland. As a LEED Platinum facility, we are also an eco-friendly option. Whether you’re hosting your closest family and friends or accommodating 500, this National Historic Landmark provides the perfect setting. After your nuptials, guests can proceed to the picturesque Cherry Street Room. Nestled below the historic Philadelphia Yearly Meeting Quaker Library, the room boasts high ceilings and an abundance of natural light. After what we hope is the ceremony of your dreams, we suggest making your way to our captivating tree-lined courtyard to treat your guests to an hour full of delectable delights and mingling. Finally, choose between an intimate sit-down reception for 200 and a buffet for 100 to leave room for dancing. Whichever you decide, remember that our goal is to be a support to you and make this day as special and spectacular as you’ve always dreamed of. Since 1856 Friends Center has been a gathering place for community groups. 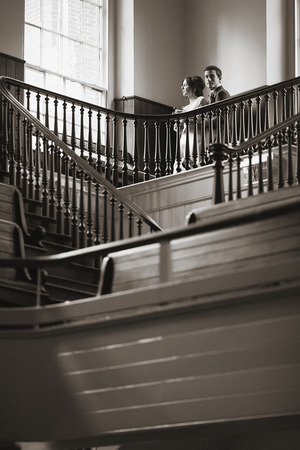 Our historic Quaker Meetinghouse is the perfect location to bring together family and friends for your special day.